HMS Dragonfly - lost in the Banka Strait, 14 February 1942. 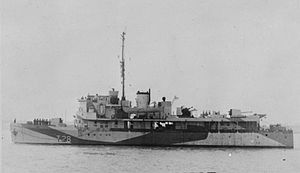 HMS Grasshopper - lost in the Banka Strait, 14 February 1942. HMS Locust - sold for scrap in 1968. HMS Mosquito - lost on 1 June 1940, off Dunkirk. HMS Scorpion - upgunned variant. Lost in the Banka Strait, 13 February 1942. HMS Bee - cancelled, March 1940. ^ a b c d e f Cocker, Maurice (2006). Coastal Forces Vessels of the Royal Navy from 1865. Stroud: Tempus Publ. p. 101. ISBN 075243862X. This page was last edited on 3 March 2018, at 16:45 (UTC).